I recently had a poem published in Verse-Virtual: An Online Community Journal of Poetry. In this excellent and unique publication, the published poets are encouraged to contact each other to show their support for poems that move them. (No critiquing allowed.) The editor, Firestone Feinberg, is a joy to work with and warmly encouraging of new writers. I wrote “Nadezhda, If You Were Here” quite a while ago, and as I prepared it for submission I was thinking about where poems – my poems – come from. In this case, I was reading a memoir by Paul Auster (I believe it was The Invention of Solitude.) In it, he includes an extraordinary letter written by Nadezhda Mandelstam to her husband, the poet Osip Mandelstam, after he’d been sent to a labor camp by Stalin. I had never heard of these people, but I was so struck by the letter I just had to read Nadezhda’s amazing memoir, Hope Against Hope, about her life with Osip. I was reading the memoir in Wegmans grocery store on a cold winter day, when I was inspired to get another cup of coffee and start writing. That’s where my poem came from. I wasn’t sure I had much to say, but it turned out to be a direction worth exploring. 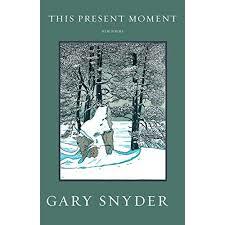 This summer I’m enjoying This Present Moment, a collection of poems by Gary Snyder, who is now 85. Remember the Beat Generation? Gary Snyder is one of America’s greatest living poets. This volume includes poems about being a homesteader, father, husband, friend, and neighbor. (I’m paraphrasing the jacket copy because it is a good summary of the subject matter.) The final poem, “Go Now,” is about the death of his wife. Even if you’re not a fan of poetry, I encourage you to take three minutes to listen to this poem by Nobel laureate Wislawa Szymborska, “Life While-You-Wait,” read by Amanda Palmer and passed along by Maria Popova and Brain Pickings. (Scroll down the page to get to the recording.) I think you’ll like it. I’m a huge fan of Wislawa Szymborska. I don’t know anything by Gary Snyder, but I look forward to investigating! I’d like to read more of Wislawa, I don’t know her well. Very different from Gary Snyder. Thank you Judy. I think many of us bloggers have a lot of passion, don’t you?